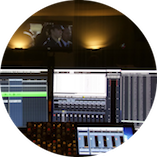 The company has over 25 years of experience in dubbing films and TV series and it has been growing steadily ever since it was founded (see our references). Bringing together the perfect creative teams of dubbing writers, directors and voice actors, we have worked on hundreds of movies and several thousand TV episodes. We maintain a close cooperation with our clients and take care of the whole creative process, including translation, script writing, casting and booking voice actors, recording and mixing. Our workflow is tailored to our clients’ individual needs in response to the latest digital image and audio requirements. Our dedicated employees put the creatives’ ideas into practice using state-of-the-art technical facilities. Specialists for the entire exploitation chain, from theatrical release to OTT, video on demand, streaming and linear TV programming supervise every stage of production. Our very own team of qualified translators processes about 1,100 hours of content for different channels each year. Our expertise covers the following languages: English, French, Russian, Italian, Spanish and Polish. We are one of the third largest companies in Germany that produces voice overs. Working with state of the art online tools, enables us to process large scale productions. 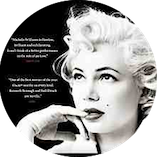 We’ve introduced a tapeless workflow that begins with the download of the uncompressed HD material in the country of origin and includes the German language work as well as the entire German image editing. At the end of the process, the fully localized production is loaded into the playout centre. State-of-the-art online tools ensure process control for large volumes of programmes. We can provide our clients with advice on everything from the procurement and handling of materials and the digital workflow, to the delivery to authoring studios, broadcasters and film laboratories. 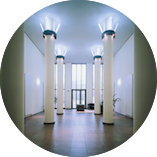 One of our particular strengths is our location in Berlin, and the investment made in the company-owned building. 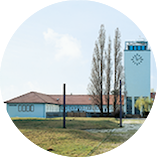 The architectural monument was designed by Bauhaus architect Franz Ehrlich and painstakingly converted for our use.